Well Edwin Starr may write a good song but when it comes to the use of arty (artillery) he knows nothing. So let us start and evaluate what it is good for and which type to take and its cost effectiveness. Pinning enemy infantry, ready for an assault by your infantry is where we will start. Now this can be tricky as it requires some good judgment on the template placement and ranging in so that you won’t be inside Danger Close range of friendly troops. So how do we achieve it, one, by having good line of sight from available team leaders and FO (Forward Observers) so that you can position that marker were you need it, preferably at the back of the enemy platoon. Now the goal here is not to kill but to keep the enemies heads down so that your infantry can benefit from the reduced defensive fire while launching an assault. Having an FO to do this increases your changes of ranging in. So that one is probably trickiest use of artillery, but what about other things like tanks and AFV (armoured fighting vehicles) I hear you say. Well as most tanks have a Top Armour of two it makes it hard to destroy them and the chance of making them bail quite low so it’s best to leave heavy armour to the dedicated anti-tank units like Milan’s and Spandrels. The best use in this case is to go after soft skinned AFV’s as they Top Armour is ether one or zero and if it’s a transport a good chance to take out some pesky infantry as well. So that’s two ways of basic uses of artillery. Next we will look at the types of artillery and how to use them. Rockets are great for coverage and area suppression of a target since they use a Salvo Template rather than the normal Artillery Template. This is great for getting large units of infantry or AFV’s that are too spread out for normal artillery to target and hit. Now once again don’t think you will be able to destroy tanks as rockets tend to have a low AT rating. Next up the humble mortar. Mortars, like rockets don’t have the AT rating so don’t expect them to take out tanks or AFV’s in droves. Best use for these is to lay down some smoke to ether get your infantry in position for an assault or to cover a flank of your precious tanks from enemy AT fire while they advance. Now on to the juicy bit, the special ammunition types. These will require you to pay extra points, so are they worth taking? That really depends on your Force and that of your opponents. First let’s talk about the different types of ammunition. American M109 and Soviet Acacia self-propelled artillery can take Laser Guided Projectiles. These require either a Forward Observer to guide it onto the target, or for the artillery to engage in direct fire of the target. The American Copperhead is great for dealing with tanks as it has a higher AT than normal bombardments therefore increasing you changes of knocking out enemy armour. The Soviet Krasnopol round is fantastic at knocking out pesky anti-tank teams thanks to it’s 1+ Firepower. Next up is Minelets. These allow you to create minefields with your artillery on the fly. Oh boy do I love these. The main purpose of these is to create choke points where funnel the enemy into a kill zone. Used correctly you can wipe out or manage a larger force with a smaller one. An example of this would be a West German Leopard 2 Company going up against a Soviet BMP horde. For the Leopard 2 force, just seeing this can give a player a nightmare but with clever use of Minelets you can force your opponent to reposition their units around the mines and give you the best use of your guns while potentially denying them theirs. This is best used in conjunction with terrain by placing mines in open gaps forcing them to choose between the minefields or the terrain itself. Last but not least are the bomblets. 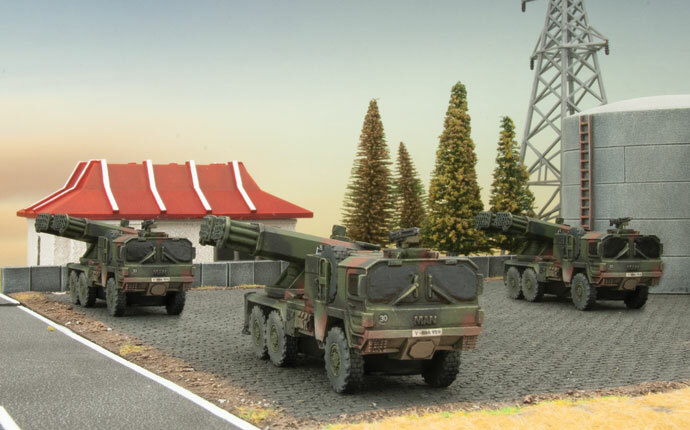 For these little guys it is the same principal as rockets which are great for suppression by providing you with a salvo template and allowing you hit wider area. Infantry caught in the open will not enjoy the experience at all. 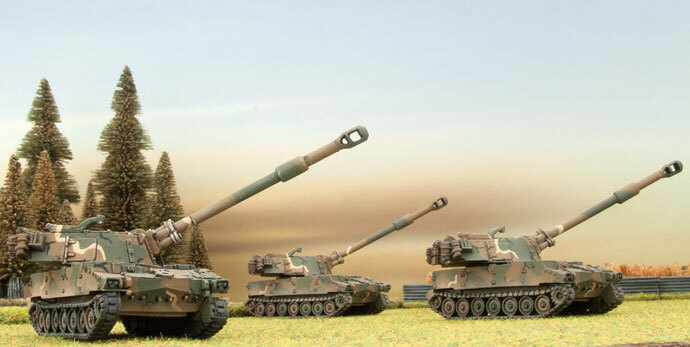 As for deploying your big guns generally you want them somewhere you get great table coverage and out of line of sight to avoid counter battery fire from enemy arty. Unless your goal is to use the arty as a direct fire platform, however I’d advise against it as your arty is very soft skinned and prone to being destroyed if able to be seen. The other one is the deployment of the ranged in marker at the start of deployment for certain missions, if placed well it can give you an advantage from the start. Choosing where to place it can be difficult but if placed in a wood in the enemy deployment zone this can then deter infantry and keep them pinned from turn one. Another is to place it in the most likely axis of advance of the enemy’s route as it can force them to rethink how to move and allow you to set up that all important choke point. So that is some of the uses for artillery and last of all the cost. 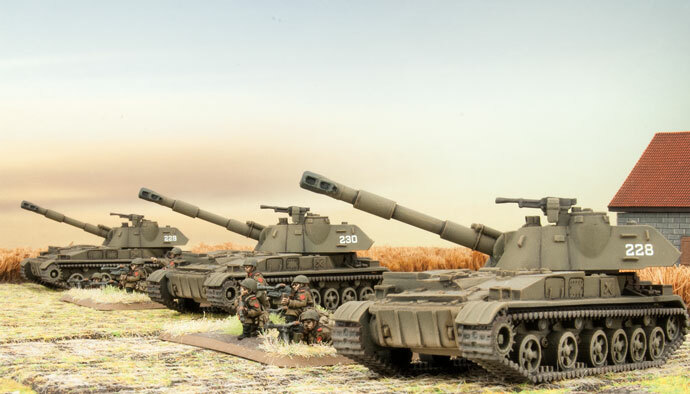 While weighing up the cost of arty to things like air support it can become a difficult choice, especially if you are a Soviet or East German player, NATO players might find it a bit easier. At the end of the day it comes down to what role you want them for be it cheap mortars and rockets for suppression and smoke or arty for range and the direct fire just in case things start to look bad. So I hopefully you have enjoyed this rollercoaster ride with me today about artillery and I wish you the best of luck in the future. Play some games try new things with your arty and remember it’s not just to pin infantry and that they are other ways out they that can give you the tactical edge in the fight. So enjoy and happy spotting.